While I was shopping at Dash Market on Hertel yesterday after work I saw a Hassidic Jew. 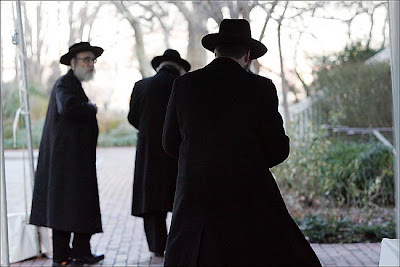 Well, I am not sure what the correct term is but he was some sort of Orthodox Jewish man with a long black coat, down to his ankles, and a wide black hat, and long gray locks of hair. I mean the locks of his hair were falling down about a foot. Above is a picture I found of Hassidic Jews but the man I saw was far more dramatic. The guys in the picture above were nothing next to him. The man I saw in Dash Market was taller and older and his hair was longer. He was like something out of another millennium. It was so cool to see someone like that! I stood behind him at the fish counter on purpose. He was buying salmon and he spoke hardly any words while pointing out exactly what he needed. I wonder if he was not supposed to talk. Once I forced a monk who was not supposed to talk to talk. But that is another story for another day. He was one of those monks in Geneseo where they make Monk's Bread. I bet wherever he is now he remembers me. I mean no disrespect here as I discuss these religious figures. I cannot stress that enough. I love the sight of them and the connection they make me feel with an ancient world. I celebrate their all-too-rare appearances in my life. A while ago at a Rite Aid I was approaching the checkout when I realized that in front of me was a woman wearing a dark head scarf. Well, that was what I thought it was. Then she turned around and I realized it was a nun. When was the last time you saw one? Outside of a Mel Brooks movie, I mean. Mel Brooks must have gone to a Catholic grade school because no movie of his is complete without at least a half dozen nuns. 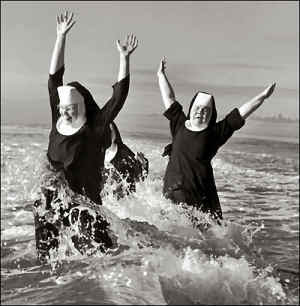 Nuns have always been exotic to some people. It was funny, reading an old magazine interview with Leonard Pennario, I cracked up because it said that Pennario's older sister had asked his mother to buy him a piano. Pennario had no sisters, just a brother. The person who asked his mother to buy him a piano was his kindergarten teacher at Holy Angels in Buffalo. She who was a nun named Sister Macrina. He must have said something about "a sister" -- hence the misunderstanding. Nuns are really rare now. Now you would certainly be misunderstood! Click on the Pennario link above, by the way, and you get to hear Pennario playing variations he wrote on a nostalgic Irish song he learned when he was a boy at Holy Angels. Speaking of rare religious types gives me an idea. We should play a kind of Travel Bingo as we go about our daily lives. We could have cards with spaces with spaces like "Nun," "Hassidic Jew," "Amish Man," "Monk," "Monk With Vow of Silence," etc. 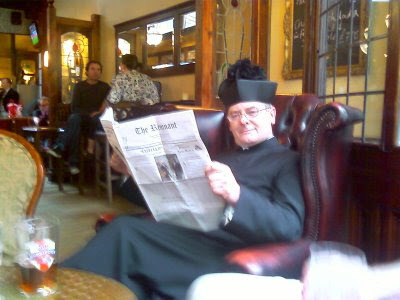 You would need an actual monk and even though it would be fun to meet T.S. Monk and get him to tell stories to you about his dad, he would not count for our Religious Bingo. Neither would Mel Brooks himself. It would have to be a nun! Isn't this fun? I am smiling just thinking about spotting these people. They may be rare, but they are out there! It is so nice to know they still exist. 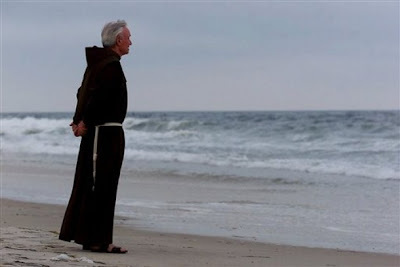 Ah, monks. They have to be creative sometimes, given their vow of silence. Ward, that is hilarious! The way they flash the FOR E-VER and E-VER!! Is that the gang over at St. Paul's? I would not put it past you. Hardly -- I think it may be stolen from the Boston Gay Men's Chorus. 9 years of the Nuns at Catholic Grammar school, and in retrospect I have to say an experience I would not have traded for anything in the world.